She has been the voice to some of Bollywood’s biggest stars on some of the most beautiful and best tracks in the Hindi film music canon. We are talking about the incredible Madhushree. 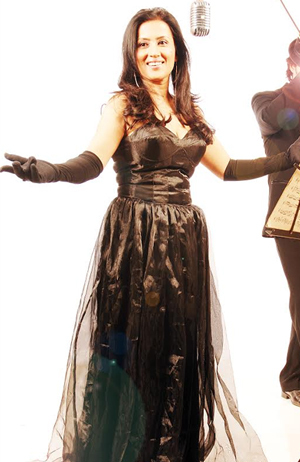 She was worked with Shankar-Ehsaan- Loy, Sohail Sen, and extensively with AR Rahman to name a few. From ‘Neem Neem’ (Yuva), to ‘Pal Pal Hai Bhari’ (Swades), ‘Tu Bin Bataye’ (Rang De Basanti), ‘Inn Lamho Ke Daaman Mein’ (Jodha Akbar) and so many more, the singer has brought the emotion and the beauty to life with her incredible voice. And that is just in the Hindi film industry, the singer has also sung for films in the South film industries as well. I was very excited to be able to do an email interview with one of my favorite singers and even more excited when I received the answers back. Check out Madhushree’s fabulous answers as she reveals what it was like to sing some of her best songs, work with AR Rahman and many more musical things! Was singing something you always wanted to do? Yes, singing is my life. AR Rahman once called me from LA, where he was watching old Bollywood songs of Lata Mangeshkar and he thought of me. What was it like when you got your first job? Tell us about your experiences being a playback singer for the movies. If you work so hard for something and you get rewarded, then it feels good. Everything changes, people starting speaking to you, watching you. You become an attraction, a celebrity. How do you approach each song? For me each song is as if it was the first song of my career. Only in this way I can justify the song. Obviously all the experiences of my previous recordings will help me do a better job. What inspires your amazing performances? It took 13 days to create this track. Mani Ratnam Ji, Mehboob Ji and AR Rahman, we have stayed up so many nights. There is laugh in the song, which is happened when I was dubbing late at night, all of sudden I saw Mehboob Saheb sleeping with open mouth and I laughed. And AR Rahman liked that and kept in the song. This was my first song with AR Rahman. It’s a thumri duet with Sadhna Sargam Ji. I always ask the music director what is the thought is behind the song. So I asked Javed Akhtar Saheb and he said “Madhushree, tum zindagi me sabse jiyada kid cheez ko pyar karti ho?” I said, “Music”. Javed Ji replied, “Every artist wants to be remembered for their work”. Believe or not ‘Pal Pal Hai Bhari’ is recorded in a hotel room in Panchgani, in the middle of Shah Rukh Khan, Ashutosh Gowariker, Javed Akhtar and AR Rahman. It has never been redubbed because it was sounding so good. Miracles happen. I was supposed to sing the ‘Vari Vari’, but this was dubbed in UK and I was in Mumbai, so I sung the holi song ‘Dekho Aayi Holi’. Rakeysh Om Prakash Mehra Ji said: “Hey AR, whose song is this? It’s so beautiful, I love it.” AR: “Oh, it’s just for my bank… I got a tune in my mind and since Madhushree is here, I made her hum this.” Rakeysh: “I want this song for RDB.” AR: “You don’t have a romantic situation in your movie.” “I will create a situation for it,” Rakeysh Ji replied. I got a call 12.30 in the morning from Javed Akhtar Ji. I was shivering with fever that night. It was urgent for the shoot, so I went there and Sonu Nigam was already dubbing it… I waited and finally I could sing 5.00 o’clock in the morning. And you know the rest. Oh no… You can expect anything from AR Rahman, just listen to the song and you will hear how difficult it is to make all those sounds by mouth. What has been your favorite song to sing? A song from the upcoming movie Amrapali. It’s a duet with Ustad Rashid Khan, which has classical and romance in it. What star do you think your voice fits the best? Since my voice has both highs and lows, it fits in any kind of stars. And I always try to copy the character of the actor. A singer always tries to put life into a composition. What is it like to work with AR Rahman both in the studio and then on stage? With AR Rahman I have learned how sing in studio and do live shows at the basic end. As you all know, most of my songs are composed by him. AR Rahman makes you feel easy and confident, he never sticks to a particular way of recording and allows the singers inputs too. Also I have tried different things in his live show tours and he was always supportive. How has music and recording changed over the years? India exists with so many music styles and cultures and that’s why our music is so different. From east to west and north to south, you will amazed be with diversity in music. Only problem is that leading Bollywood misguides you with real music. Bollywood music is mainly popular followers music, which keeps changing. It is the listeners choice what to like and not, but the marketing of Bollywood is so intensive that frequently the good music gets lost. What do you love about singing? It’s like getting air to live life. Who do you admire as a composer? I can compose, but I love to sing everyone’s composition. What I admire about it is that a composer creates a song, which can be loved by so many people and it’s for infinity. Is there a difference between singing for the Hindi film industry and the South film industries and if so what? Yes, there is a huge different in singing Hindi and South film industry, where the Hindi film industry keeps being a following industry, while the South still tries to keep their identity. What are your thoughts of the music of Hindi films today? I am a playback singer, so follow the instructions of the music composer. It would be better, if the singers try to create their own identity. Your thoughts on the music of India? As I said, India has most beautiful music of the entire world. If someone were an aspiring singer, what advice would you give? Try to explore and enhance your qualities. I’m busy with all kinds of music, besides playback singing, I’m also busy with private singles in lots of variety. 15 queries in 1.248 seconds.